Save time and increase accuracy with UDA Document Management, the powerful component that works with all of your ConstructionSuite documents such as Estimates, Schedules, Contracts, Specifications, and Reports. Advanced, yet intuitive features enable you to integrate your documents with the powerful ConstructionSuite project management system. 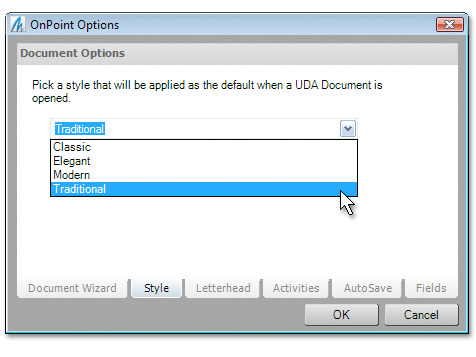 Every UDA document comes with the ability to be fully customized to fit your project needs. Use the Document Management Wizard to import contact information for any vendor, supplier, subcontractor, lender, or client, and quickly connect all documents to the ConstructionSuite database. Then, put a professional polish on your documents with easy-to-use features such as styles, letterheads, watermarks, and more. 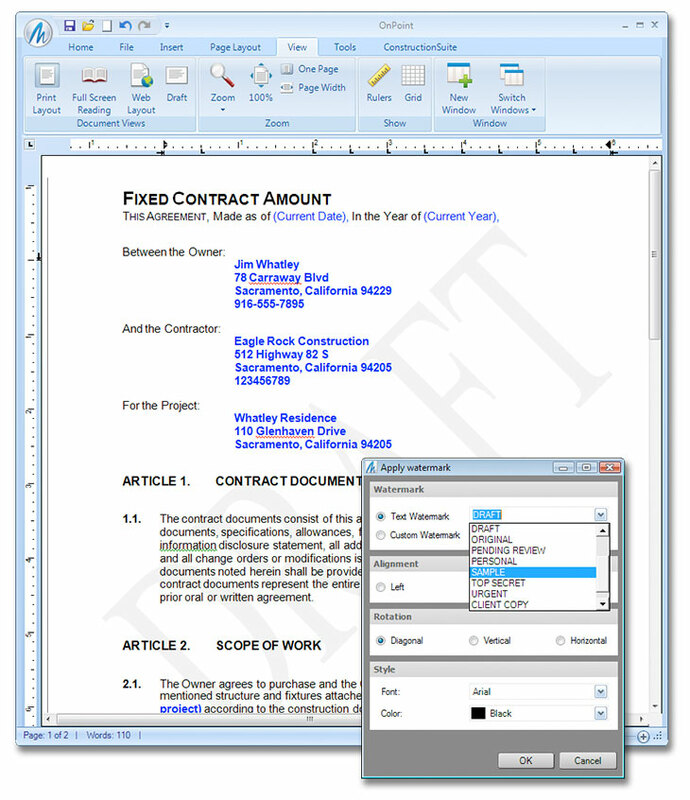 Customize any ConstructionSuite document such as Contracts, Forms, Specifications, Proposals, Reports, and more. Harness the power of advanced Document Management to create professional project documentation and connect all of your construction contracts, forms, spec books, and reports to the revolutionary ConstructionNet CRM system. Import contact information from ConstructionNet CRM for any vendor, supplier, or subcontractor in your database. Connect documents to projects for better organization and tracking. Put a professional face on all your documents with easy-to-use features like automated styles, letterhead, signatures, watermarks, automated table of contents, and password protection. Set Reminders for your documents through creating an Activity with ConstructionNet CRM. 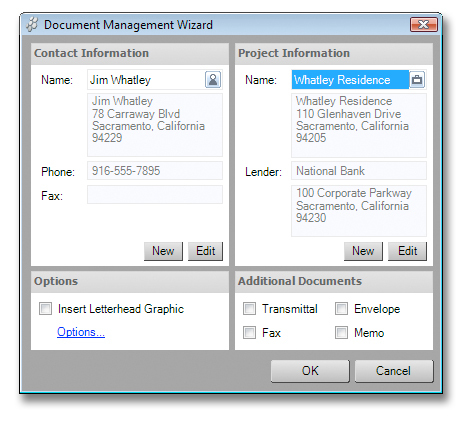 Launch automated Memos, Fax Cover Sheets, Transmittals, and Envelopes through the Document Management Wizard. Create your own documents that work with the ConstructionSuite system using UDA Custom AutoDocs Wizard. Track document creation and editing with advanced Project Logging. Automatically populate contact and project information fields. Send documents to clients using auto-email feature. Password protect documents for ultimate security. Custom Fields can be added for your projects, contacts, and company so you can insert additional information to any Document, Contract, or Report. 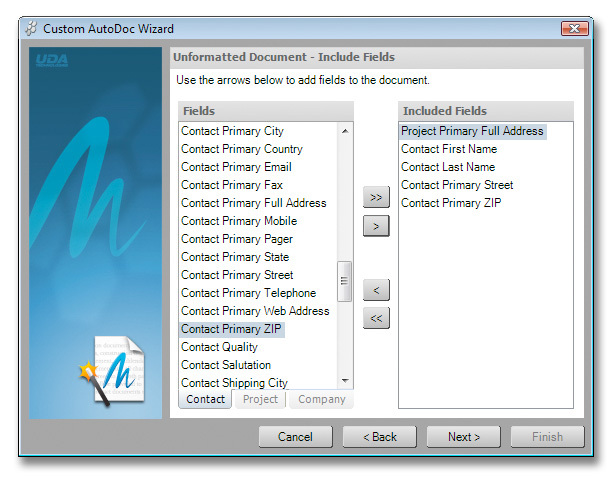 Use the Custom AutoDocs wizard to create a fully-automated construction letter, contract/form, or a custom document in a few simple steps. The Custom AutoDocs wizard is linked with your ConstructionSuite database, allowing you to easily import project and contact information. By selecting a project for your document, you've already taken one step toward integrating it with the dynamic ConstructionSuite database. 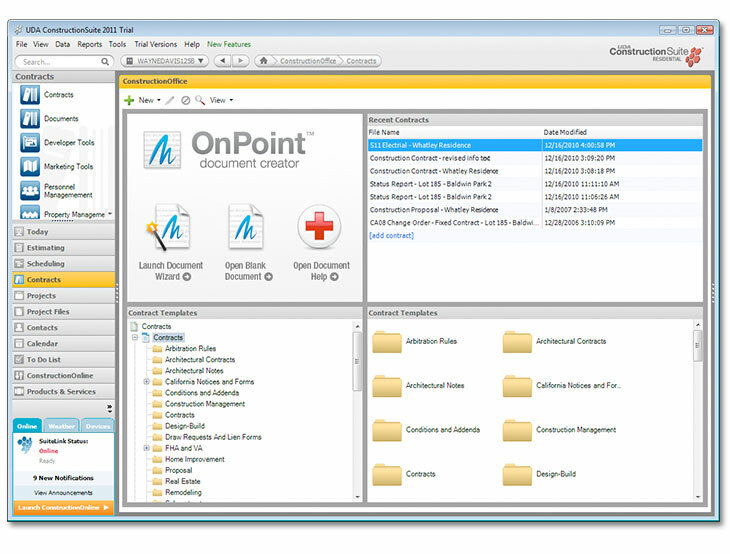 Take integration one step further by creating additional connections between your documents and ConstructionSuite. From the Document Management Toolbar, you can add Contacts, assign new Activities, create new To Dos, and launch documents or document templates from any project Workflow. Put a professional face on all of your documents and take advantage of integration with ConstructionNet CRM technology with the new Document Management, included in all versions of ConstructionSuite.